Chris Stapleton coming to the Van Andel Arena! 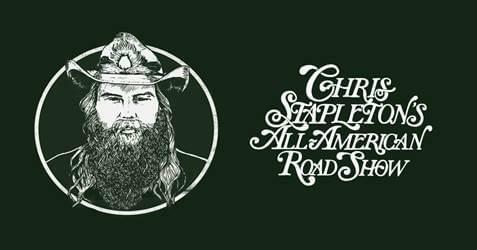 Chris Stapleton is coming to Van Andel Arena on Friday, August 16! The shows will kick-off July 9 at Allentown’s PPL Center and will span through November 2 at Louisville’s KFC Yum Center. Special guest openers include Margo Price, Brent Cobb, Brothers Osborne, The Marcus King Band, and Kendell Marvel. See below for complete details. Stapleton Fan Club pre-sales will begin Tuesday, January 29 at 10:00am. For more information visit www.stapletonfanclub.com. Public tickets for the newly announced concerts begin Friday, February 1 at 10:00am. Live Nation is the official promoter of the All-American Road Show. Stapleton was also recently nominated for three Grammy Awards: Best Country Album for From A Room: Volume 2, Best Country Solo Performance for “Millionaire” and Best Pop Duo/Group Performance for his performance on Justin Timberlake’s “Say Something”.